Michelle Alexander. Photo courtesy of Marist College. 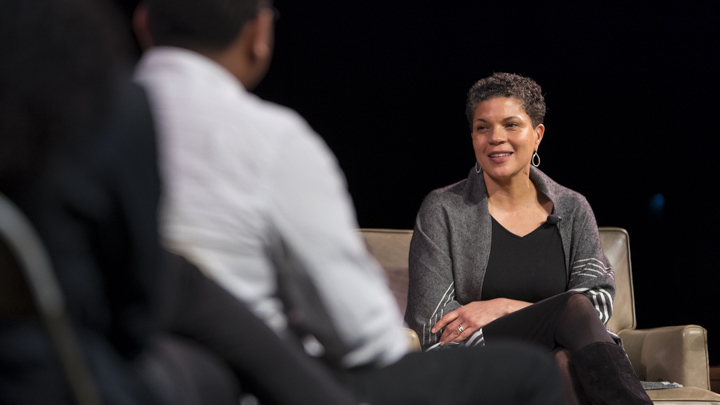 Michelle Alexander - civil rights lawyer, advocate and legal scholar - visited Marist College on March 1st to discuss the current climate of civil rights in the United States. Alexander is well-known for her New York Times bestseller, The New Jim Crow: Mass Incarceration in the Age of Colorblindness. “What this book is intended to do - the only thing that it is intended to do - is to stimulate a much needed conversation about the role of the criminal justice system in creating and perpetuating racial hierarchy in the United States,” Alexander said. The United States is the world’s leader in incarceration. According to The Sentencing Project, there are over two million people in the nation’s prisons and jails - a 500 percent increase over the last 40 years. Mass incarceration has disproportionately affected black communities. According to The Sentencing Project, people of color make up 37 percent of the U.S. population, but 67 percent of the prison population. African Americans are more likely than white Americans to be arrested; once arrested, they are more likely to be convicted; and once convicted, they are more likely to face stiff sentences. Black men are six times as likely to be incarcerated as white men. Photo Courtesy of Marist College. Alexander was inspired to write The New Jim Crow based on her experiences working as a civil rights lawyer for the American Civil Liberties Union in California. The ACLU launched the Driving While Black or Brown Campaign (DWB) in the late 1990s, focusing on racial profiling by police. The ACLU won a lawsuit against the California Highway Patrol for their racial profiling and drug interdiction practices, but was looking to continue lawsuits against other departments. One day, a young man entered Alexander’s office holding a thick stack of papers. He had recorded detailed notes of encounters with the Oakland Police Department over about a nine month period. He was Alexander’s dream plaintiff, until she discovered his felony record. She turned him away. “We couldn’t possibly represent someone as a main plaintiff that had a felony record because we knew that law enforcement and the media would be all over them saying, ‘of course the police are keeping their eye on him...he’s a felon. This isn’t about race, it’s about police going after the criminal,’” Alexander said. The man defended his innocence, claiming the police framed him. He felt forced to plead guilty, settling for felony probation instead of facing threats of up to 15 years in prison. He grabbed his notes and ripped them to pieces. Officers went on trial for using dishonest and sometimes brutal tactics in making those arrests. One of the lead officers identified and charged was an officer identified to Alexander by the man. 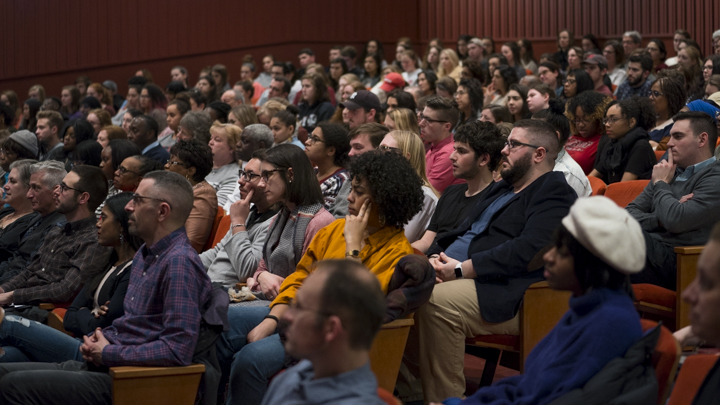 Michael Love, Marist alumnus and director of community liaisons for the Hudson Valley Community Center, inquired about the lessons Alexander has learned since publishing The New Jim Crow, as well as how racism has changed since the book’s publication. Alexander believes American politics and economics has contributed to decades of injustice toward poor people and people of color. (From left to right) Assistant Professor of Psychology Jocelyn R. Smith Lee, Assistant Professor of Public Administration Tia Sherèe Gaynor, guest speaker Michelle Alexander, Assistant Professor of Criminal Justice Addrain Conyers, and Bryanna Adams '17. Photo Courtesy of Marist College. Mark Palmer, a sophomore political science major at Marist, addressed the current opioid crisis, questioning societal response compared to the war on drugs - specifically, if the opioid crisis should be treated through public health or criminal justice. “Putting Donald Trump aside, for the most part, legislatures and law enforcement have treated the opioid crisis with much more care and compassion and concern than was ever afforded to folks who were struggling with crack addiction,” Alexander said. According to the National Institute on Drug Abuse, more than 64,000 overdose deaths occurred in 2016, including 20,000 overdose deaths from synthetic opioids. Alexander argues that the United States should decriminalize all drugs from personal use. Portugal decriminalized the use of all drugs in 2001, launching a major public health campaign to fight addiction. In 15 years, only about 25,000 Portuguese use heroin, down from 100,000 when the policy began. Overall, Alexander is hopeful for the future of civil rights in the United States, but there is much more work to be done.